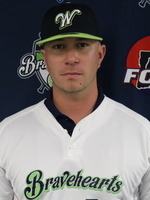 Alex Dion is the new Bravehearts Manager after spending his first summer with the team in 2018. He is currently a teacher at Milford High School and was named the Head Coach of the Milford varsity baseball team on 9/27/17 after serving as an assistant coach since 2014. He has also coached for Team Mizuno in the summers of 2014 & 2015 and Northborough American Legion in two separate stints: 2011-2013 & 2016-2017. Alex is a native of Westborough, MA and a 2007 Westborough High School grad. He attended Western New England University and has a degree in Business Management.